Some of you may know that four years ago I started taking photography more seriously, mainly as a way to express myself but also to force me to get up my chair and explore cities, connect with people and enjoy some fresh air. While I started with street photography and I'm still passionate about it, I've recently become obsessed with landscape photography. It's not only one of the most technically challenging styles but it also pushes you to get out and enjoy nature. Hence, six months ago I decided to go on a 12 day photo expedition to New Zealand. I enjoy writing as much as I like taking photos and I intend to use this medium to share this upcoming experience with my loved ones, my friends or whoever is interested in photography, travel or thinking about going to New Zealand. I don't handle long flights very well. I can't sleep upright and I get a bit claustrophobic after a while. I knew New Zealand was far from Toronto. What I didn't know is that it was going to be a 23 hour journey to Christchurch. I'm bringing with me all sorts of ridiculous pillows, an eye mask, earplugs and every single gadget you can imagine to keep myself entertained. My flights departs in less than 24 hours (Friday) and I still don't have a (Canadian) passport to travel. I'm seriously stressed. You see, only two days ago (Tuesday) I became a Canadian Citizen (hurray) and right after the ceremony, the government takes away any travel documents you may have had earlier (Visa, Permanent Resident card...). They explicitly ask you during the ceremony to wait two business days before you can apply for the passport. Well, I can't wait two business days or I'll have to reschedule my flights. No way! I decided to wait 1 business day and apply for it today at 7 am (Thursday). Phew! I am in their system... I paid a hefty sum to get it as soon as possible and I'm getting my passport Friday morning, only hours before I board. I can breath. It's sinking in. I'm going to New Zealand. Ok, it's real, I have a passport. Ready to go to the airport. I'm finally excited! I'm going for 12 days to a place I've never been, with people I've never met, to do an activity that I've never done. In case you were wondering, I'm not going on my own and I didn't plan this trip on my own. 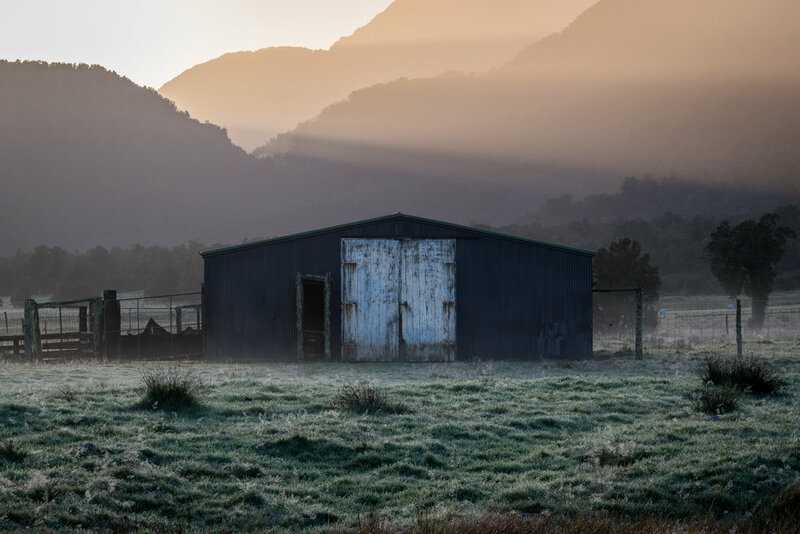 I'm going with a small group of 6 people led by two professional photographers: Phillip Bartlett and Joshua Holko; I highly encourage you to take a look at their breadth-taking portfolios. I'm always a bit nervous of traveling with strangers, but in this case, I already know all these people share a passion for photography, the outdoors, the aventure and that is comforting in a way. I'm exhausted, but excitement is keeping me alive. If you're reading this on a Saturday, I'm writing you from the future; here at Christchurch it's already Sunday. Fun Fact: During my layover in Aukland I ran into famous photographer and awesome blogger Trey Ratcliff. If you don't know who he is, check-out his famous travel photography blog Stuck In Customs. I was too shy, to jet-lagged and to slow to ask him for a photo. Plus, he was with is family and it was 4 am... I didn't want to be that guy. I arrived at my hotel around 9 am, took a 1 hour nap and now I'm off to explore the town. The group will be meeting after 5 pm, if I make it until then. The adventure begins tomorrow, meanwhile, here's a little video I created of my journey so far. I woke up at 4:30 am, but had a good sleep. We meet at 8:45am at the hotel lobby to drive close to 4 hours to Twizel where we'll stay for a night. 2:00 PM - After making a quick stop at an iconic and very touristy landmark called the Church of the Good Sheppard, we made it to a little village called Twizel where I will stay for a night. We've checked in at out our hotel and we're off to catch the sunset. The drive was amazing, full of colours and contrasts. There is a mix of autumn foliage and snow which I've never seen before and apparently is very rare, so I'm looking forward to shooting some amazing photos. It's a bit overcast but it's starting to clear up. 8:00 PM - It's been a long day and productive day. We went to lake Ohau... A crystal clear turquoise lake surrounded by mountains and despite not having any sunlight, I was able to get a few good shots . I will share a few of them with you tomorrow but for now, I'll post this one below. We ended up the day going to a restaurant near the hotel where I ate what could very well be the best lamb curry I've ever had in my life. Tomorrow we start at 6 am so goodnight for now! Sunrise is at 7:35 am so we meet at 6:00 sharp to drive to an undisclosed location near Mt. Cook, the highest mountain in New Zealand. It was still dark and for 45 minutes I could barely see where we're heading but I can seethe sky covered in clouds and I'm concerned we'll even get a sunrise at all. The road is infested with wild rabbits and near the end of our trip, we came close to hitting a dear. I'm awake now. I did most of my shots with the 70-200mm lens, mostly at 200. My intention was to get a portrait of the mountains; get up close and personal. This turned out to be a phenomenal morning. No wind, great clouds and beautiful light. Check out this video to see where we were this morning. we went to the opposite side of where we spent the morning to get a different angle of Mt. Cook. To the right are some photos photos taken with my phone. Below is a photo of the afternoon location; it's not my favourite but it should give you a good idea of the view, the location, the weather, the feel. Today must have been one of the most challenging shoots so far. By now you may have figured that we're doing sunrise and sunsets shoots and today was no exception. 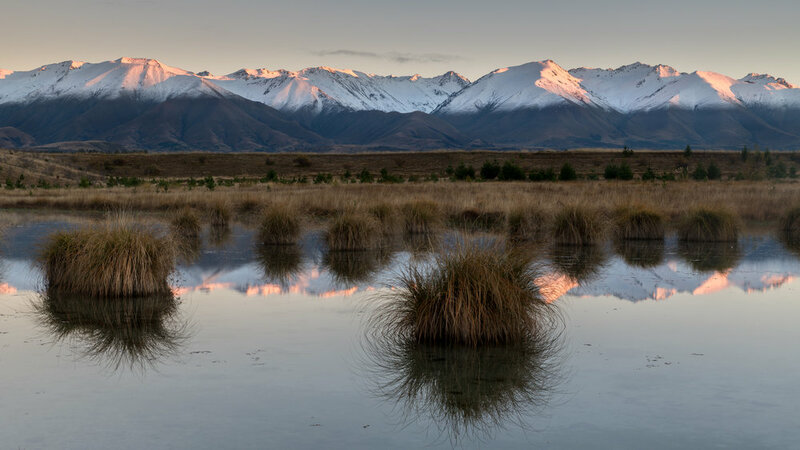 A fifteen minute drive from Twizel at 6:30 am to a secret location to get a fantastic photo of the mountains and their reflection. Setting up our gear was quite challenging as it was not only dark but it was in a "swamp". The peak of the mountains lit up with a pink glow as the sun started to rise. Once done, we went for breakfast at 10:00 am and made our way South East to the coast. We're spending the night at a famous location called Moeraki, known for its beach boulders. It's a well known place which means you'll innevitably find the occasional tourist bus, but that doesn't make it any less beautiful. According the their official website, "the Moeraki Boulders are a group of large spherical 'stones' on Koekohe Beach near Moeraki on New Zealand’s Otago coast. They originally started forming in ancient sea floor sediments around 60 million years ago, and the largest boulders are estimated to have taken about 4 million years to get to their current size." We're spending the night here to take a few pictures at sunset and another session at sunrise at a time where we should have the place to ourselves. The afternoon session was the most challenging son far due to the high tide, the waves crashing, the tripod legs sinking in the sand, my bear feels freezing in the cold water and nailing the exposure and shutter speed to get that silky smooth water effect. Without a doubt, this has been one of my favourite sessions so far and I look forward to doing it again tomorrow morning. Here's one of my favourite photos of the afternoon shoot. We started our day at the Moeraki Boulders at 6:30 am to photograph them during the sunrise. Unlike last night’s shoot, this time the sun would rise from the sea which will make a completely different photograph with an impressive sky on the background. Luckily for us, the weather was cooperating, there was little to no wind and there were enough high clouds in the sky to add texture and retain the colours. The high tide has passed and this time I was able keep my shoes on. It’s still dark, so before the sun rises, I fool around with my camera setting and I "paint" the boulder with my head lamp. It’s usually a cheap trick, but I like how this one turned out. It's 7:30 now and colours are bursting in the sky.... nature is showing off. The water has now recessed and this calls for a different composition, this time vertical, to capture as much sky as possible. By 9:00 am it’s over, the sun’s out, the hordes of tourists are in. It’s time for breakfast and to head out for a four and a half hour drive for a completely different challenge. Te Anau which will be our base for the next three days. We arrive at Te Anau at 3:00 pm sharp, take a break and we head out at 5 to a quick photoshoot. It's a bit overcast so take a different approach to photographing sunsets and we go for a (4 minute) long exposure. with the helo of Joshua and Phillip, I'm able to capture this photo. We finished the day by going to the Redcliff caffe for an amazing dinner. Tomorrow morning we'll take our first helicopter ride up to the mountain to a location that is not accessible by car. Should be a good one! We depart this morning at 6:30 am to take our first helicopter ride to the mountains to get a different perspective. This is a 5 to 10 minute ride just to takes us to the top, but unlike the coming helicopter, this one is closed doors and only meant to get us up there. Once up, it's starting to rise and we have a stunning 360 degree view. Everywhere I look is a different photo, different light and different composition. It's a bit overwhelming and need to make a decision before the sun rises. I stick to a composition for a few minutes and work my way from there. One hour later, the photo opportunities are over; the light is flat, but the view is still gorgeous, it's so peaceful and calm. My alarm goes off at 5:00 am. 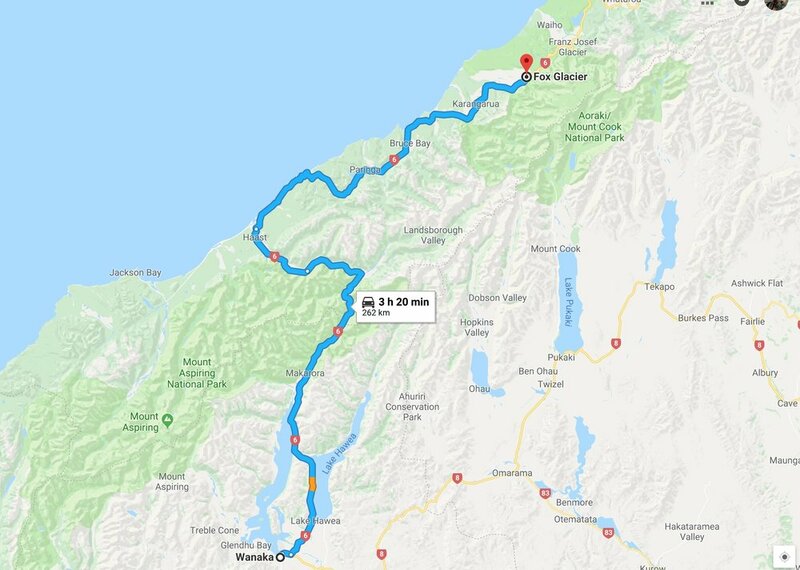 We hit the road at 5:30 and head to Milford Sound, one of the most iconic places in the South Island of New Zealand carved by glaciers. This was one of the places that actually made me come to New Zealand. It rains 99% of the time which makes a very dark and moody shot; and that's what I'm trying to go for. However, the sun starts creeping in and the sky starts to gain some colour, which you can see on my "selfie" in the left. 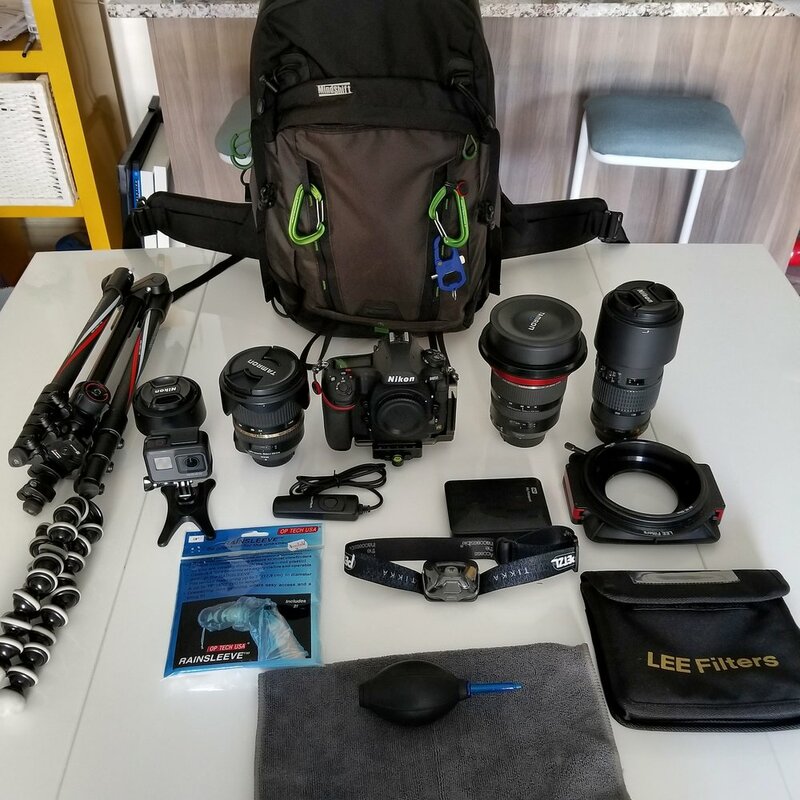 Short before 7:00 am, I setup my gear. We're the first ones to get there, but not for long. After I try different angles and walk around a bit, we head to take a two hour boat tour that takes you around the fiord. All of a sudden I'm surrounded by high peaks with waterfalls, fur seals and heavy rain. It's absolutely gorgeous. On the way back to Te Anau, we stop a couple of times to photograph the crystal clear rivers and waterfalls next to the road. It's now pouring and it's hard to keep the lenses clean. Today we leave Te Anau and we drive three and a half hours to Wanaka Lake, not without having one last morning session. We arrive on location at 7:00 am and the conditions call for a perfect morning, but we didn't know we were in for a treat. I setup my tripod as close to the water as possible to get some of the rocks on the foreground. 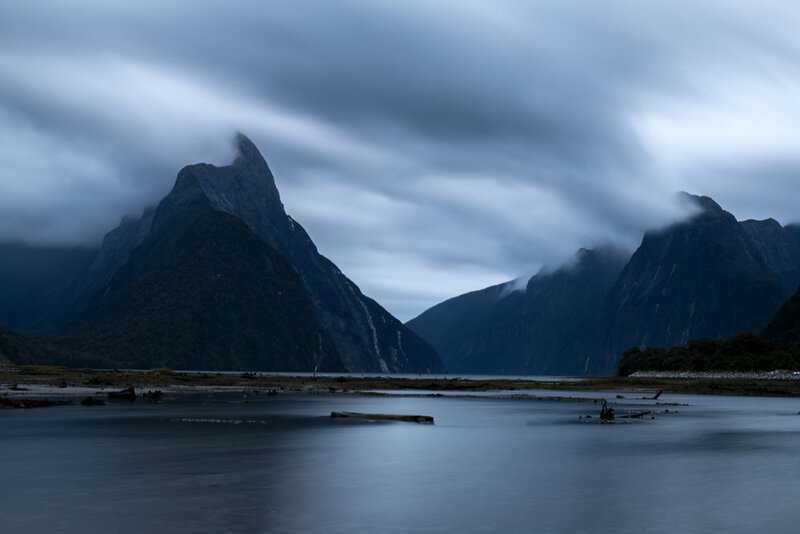 I'm really enjoying shooting during the "blue hour" here in New Zealand, that time of the sunrise (or sunset) where the sun has yet to come out and the scene is used with blue colours. Just a few minutes later, the scene changes completely, I need to quickly adjust my settings, but it's not enough. I take my shoes and socks off (per Phillip's suggestion) and I get in the water to get closer to the rock. The water is freezing, it's not a pleasant feeling but it's worth the shot. The sky is now bursting in colours and there are some dark clouds in the background and a ridiculous rainbow. 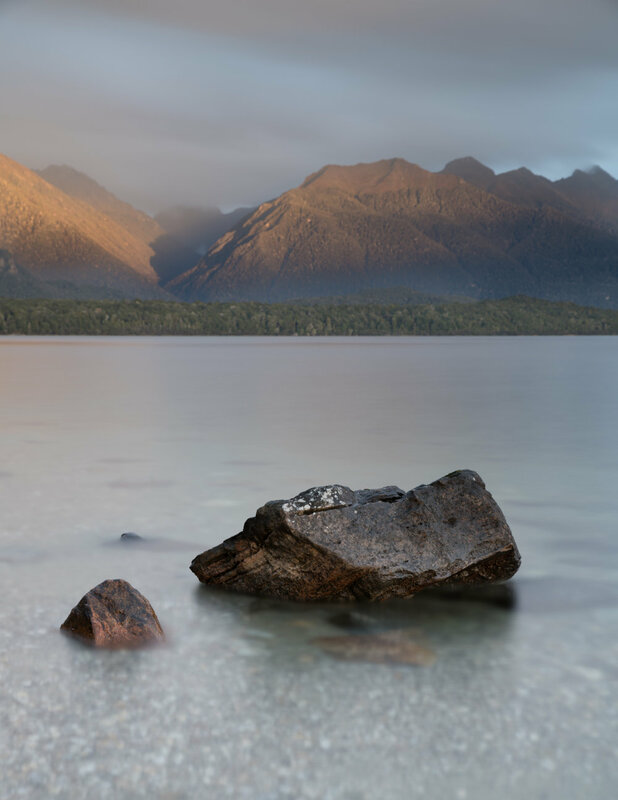 At 10 am leave Te Anau and depart to Wanaka where we'll spend the night to photograph the Wanaka tree in the morning. After breakfast we'll depart to Fox Glacier where we'll spend our last three days and will be taking the second helicopter ride. We're saving the best for last. 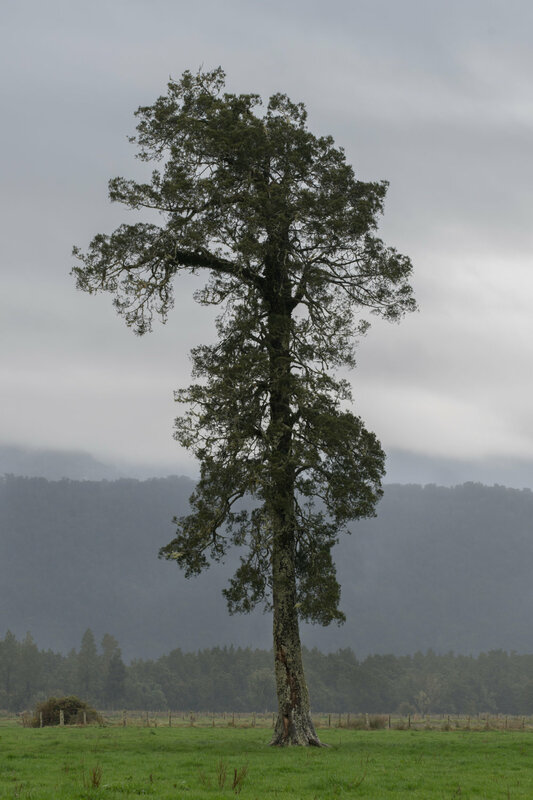 At 6:30 am we head towards the Wanaka Tree to get a prime spot before the rest of the tourists arrive. We're the first ones there, it's still dark and I immediately setup my trip and start shooting some long exposures (2 minutes). The Wanaka Tree is one of the most photographed icons in New Zealand so it's hard to get an original shot but that doesn't make it any less aesthetic. The tree has lost all its leaves and there are some birds resting on it; the scene has an eerie style to it so I go for that look. We depart to Fox Glacier for the last three nights of our photography trip. 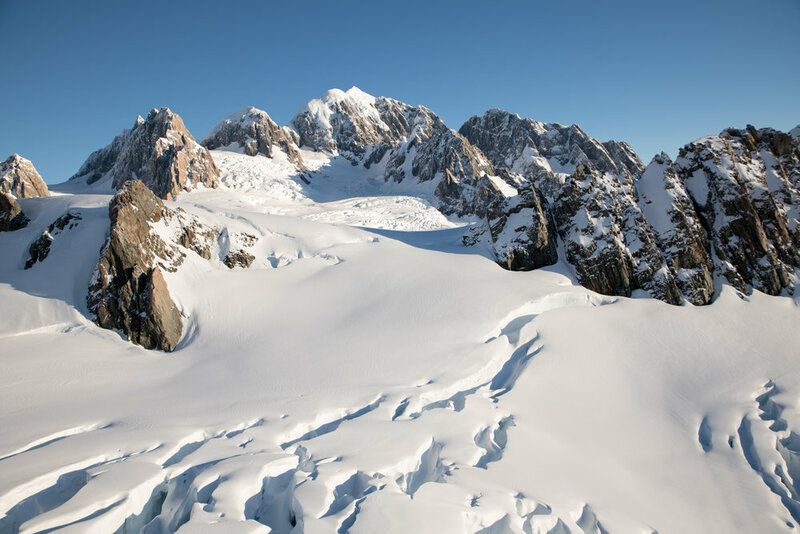 At Fox, we'll be waiting for the right conditions to take an open-door helicopter for thirty minutes to photograph the glacier from the top. This is the cherry on top, but it could very well not happen if we get rain and gust winds for the next three day. During the road trip, the scenery and landscape quickly change and we begin driving through winding road surrounded by layers of mountains covered by a dense conifer forrest. Rain doesn't stop and there are waterfalls everywhere you see. We make a few stops on the way to Fox to break the trip. Around 5:00 pm we finally make it to our destination. It's raining so we call it a day, take some rest and we go for dinner where we celebrate my birthday :). It's pouring rain in the morning so we get to sleep in. Around noon, the rain seems to stop and while it's still overcast, we take a chance and we drive about 20 minutes to a couple of place. With little light in the sky, the idea is to work with tonalities, low clouds and local trees and vegetations which makes it a great challenge. It hasn't stoped raining so at 2 pm we call it a day. We gather around 4 pm at a local coffee place te review some of our best shots and get some critique by professional photographers Joshua Holko and Phillip Bartlett. At 6 pm we regroup for dinner and we get instructions on how to setup our camera settings for tomorrow's helicopter shoot over the glacier. It's trickier than I though due to the fast movement, the brightness of the ice and the vibration and movement of the helicopter. I can't wait, I'm so very excited about this! Today, to say the least, is the cherry on top, the climax of this trip. Just today, I shot a little over 800 times and that should tell you everything. But without a nice, clear morning, this wouldn't have happened, so let me start there. I'm in the final stretch of my trip and I'm just getting used to the timezone, bummer. I woke up at 7:00 and noticed there was more light than usual. I looked outside my window and there wasn't a single cloud. The grass was covered in frost, there was some mist in the fields and everything looked calm so I decided to grab my camera and get out. That meant changing all the setting I had set the night before to get ready for the helicopter. I don't have much time before we need to leave so I walk around 10 minutes from our motel to stumble upon this gorgeous sunrise. At 9 am we head to the helicopter pad which is only a ten minute drive from our hotel. I make sure to wear a lot of layers as we will be flying as high as 9000 ft with no doors so we can get a clear shot, so it'll get chilly. At 10:30 am, it's lift off time. It takes us another five minutes to get to the top of the glacier, it's swift. The pilot takes his time so that we can get the right shots and he is directed by Joshua and Phillip to make sure he has the right altitude and distance. Twenty five minutes later, we come down. I'm overwhelmed. We go out again at 5:30 pm and the light changes, it is softer...warmer. This time around I try to leave the emotions behind and think a little more about composition, leading lines, textures and abstract shots but it's not easy. Here are three quick and dirty edits just to share the experience but it'll take me weeks before I go through all the shots, pick the ones I love and make the final edits. Unlike the previous videos, this next video doesn't need any commentary. It speaks for itself. I'm sorry for my terrible editing skills, I wish I was better at it but I hope this poor attempt conveys the beauty of Fox Glacier while still being able to share this privileged experience with you. 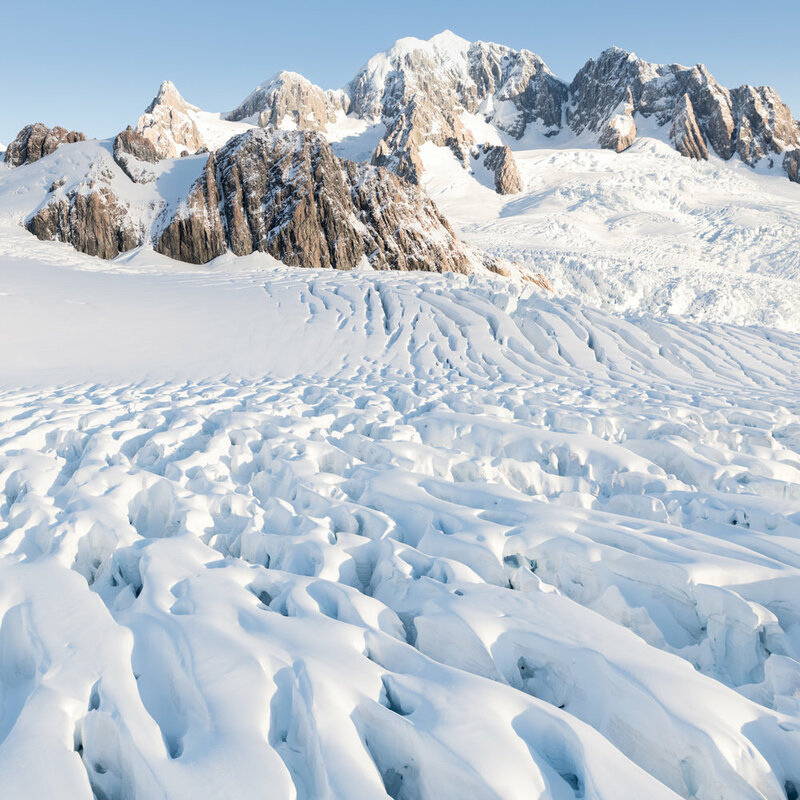 Sadly, this Glacier, like many others, is receding due to global warming. I have the complete 25 minute 4k footage of it. If anyone is interested in doing a better job, I'd really appreciate it. Our time at Fox Glaciar has come to an end and for our last photo shoot at this location we head to Lake Matheson at 6:15 am. This requires a 35 minute hike with our headlamps as it is still pitch dark. Once there, we setup our tripods and wait for the light to happen but it's overcast, and starts to rain. The sunset never arrives but I'm still able to capture this with a 120 second exposure in the complete darkness. At 11 am we pack our things and start making our way back to the East. 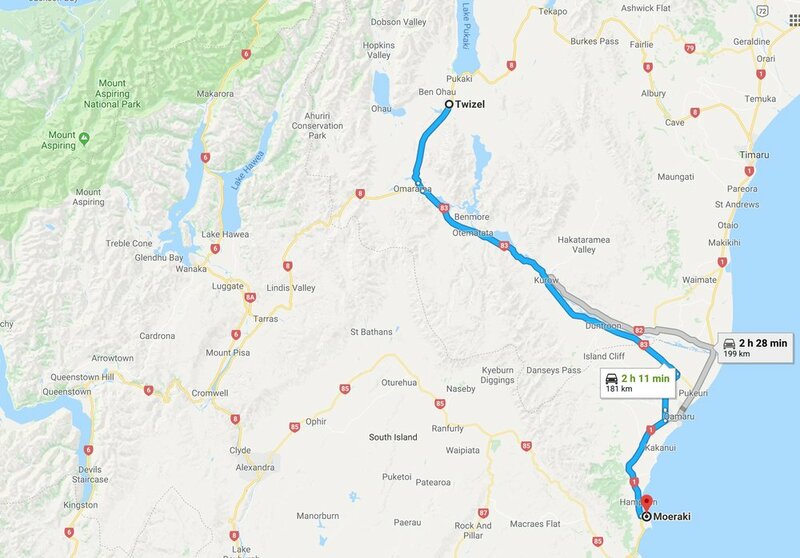 This is a two day drive with a one night stop at Greymouth. We arrive on location at 4:30 pm, set our tripods, look for a composition and wait for the high tide to bring some big waves. What you want is for the water to climb up the the rock formations, into an upwards spray. We wait for about an hour but the tide is not high enough, it's not happening. I get a "nice shot" but nothing more than a souvenir. Still, we enjoy the view and the weather . Day 13 - Thoughts and closing remarks. I'm back with a different perspective on landscape photography and a broader and more refined skills that I will be applying in other photography styles such as street and cityscapes. What now? In the next week or two I'll be selecting a dozen or so photos that I will add to my portfolio and that would look stunning hanging on my or anyone's walls. I will be updating this blog as soon as that happens. In the meantime, I leave you with one last video that sums up the best moments of this phenomenal trip. Thank you for letting me share this with you; farewell.